When you’re looking for a photo, but aren’t quite sure how you filed it away, the Elements search options are a great tool. You probably remember some detail that can help you find the photo or photos you’re looking for. In Elements, you’ll likely find a search tool that can look for that specific detail or details. Take a look at the Media Browser. At the top, you find a text box and magnifying glass. You type search criteria in the text box and press Enter or Return to search through your catalog and find matches for your criteria. If you click the magnifying glass to open a drop-down list, you find more options to narrow your search. This search feature in Elements is very powerful. Not only can you search for a single criterion, but you can take advantage of Boolean expressions to narrow your search — the AND, OR, and NOT expressions all work. For example, you can search for Jack AND Jill, and only photos having both those names in the image metadata, tags, and filenames are returned. Likewise, you can search for Jack OR Harry NOT Jill, and photos of either Jack or Harry are returned but not any photos containing Jack and Jill or Harry and Jill. To get a feel for how you use Boolean expressions, play around with the Search text box and experiment a little. When you become familiar with this powerful search feature in the Organizer, you’ll find yourself reaching for the Search text box before going to the many menu commands on the Find menu. You can tag files with a number of different criteria. When tags are added to images, you can sort files according to tag labels. Look at the Find menu and notice the Untagged Items command. If you haven’t added tags to some items and want to show only the untagged files so that you can begin to add tags, choose Find → Untagged Items or press Ctrl+Shift+Q on Windows or ⌘+Shift+O on the Mac. Elements displays all files without tags in the Media Browser, so you can easily see which photos need to be tagged. Make sure you have media added to the Organizer. If you don’t have any files tagged with captions or notes, you need to add them in the Information panel. Choose Find → By Caption or Note. The Find by Caption or Note dialog box opens. 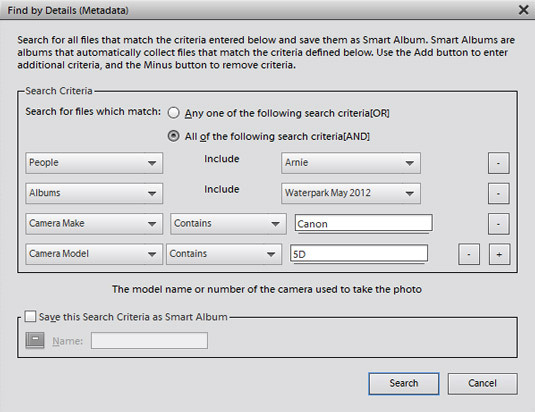 In the Find by Caption or Note dialog box, specify search criteria. In the Find Items with Caption or Note text box, type the words you want to locate and choose to match all or part of the word or words you typed. Match Only the Beginning of Words in Captions and Notes: Select this radio button when you know that your caption or note begins with words you type in the text box. 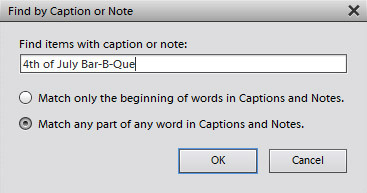 Match Any Part of Any Word in Captions and Notes: Select this radio button if you’re not sure whether the text typed in the box is used at the beginning of a caption or note, or whether it’s contained within the caption name or note text. The results appear in the Organizer. Searching history is searching for chronologically ordered information about operations performed on your media, such as printing, emailing, sharing, and so on. Elements keeps track of what you do with your photos when you perform a number of different tasks. You can search for files based on their file history by choosing Find → By History. Select the options you want on the By History submenu, and Elements reports files found on date searches that meet your history criteria. Metadata includes information about your images that’s supplied by digital cameras, as well as custom data you add to a file. Metadata contains descriptions of the image, such as your camera name, the camera settings you used to take a picture, copyright information, and much more. Metadata also includes some of the information you add in Elements, such as keyword tags, albums, People tags, and so on. You can combine various metadata items in your search, such as keyword tags, camera make and model, f-stop, ISO setting, and so on. Searching for metadata might be particularly helpful when you have photos taken during an event by several family members and friends. Choose Find → By Details (Metadata) in the Organizer. The Find by Details (Metadata) dialog box opens. Choose to search for one criterion or all your criteria by selecting a radio button. The first two radio buttons in the dialog box offer choices for Boolean OR and Boolean AND. In other words, do you want to search for one item or another, or to search for one item and another. Choose an item from the first menu and then choose to include or exclude the item. Next fill in the third column. How you fill in the third column depends on your selections in the first two columns. Items are listed as menus in horizontal rows. The third column can be a menu or a text box. (Optional) To add criteria, click the plus (+) symbol. Another row is added to the dialog box, and you select your choices as explained in Step 3. After identifying your search criteria, click Search. The media matching the criteria is shown in the Media Browser. Choose Find –> By Details (Metadata) in the Organizer to open the dialog box in which metadata are specified.